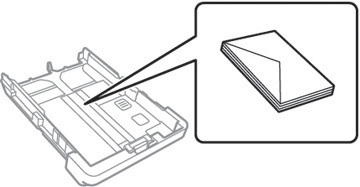 You can load paper up to this size in the paper cassette: Legal (8.5 × 14 inches [216 × 356 mm]). Note: Before loading paper, make sure your product is not currently printing, scanning, or copying. Note: If you are using legal-size paper or larger, press the button and extend the paper cassette. Slide the front edge guide to your paper size. 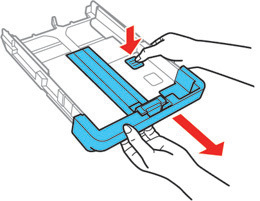 Insert paper in the cassette with the glossy or printable side facedown and slide it against the front edge guide. 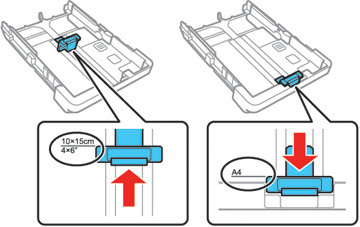 Note: Make sure the paper is loaded against the front edge guide and not sticking out from the rear of the cassette. 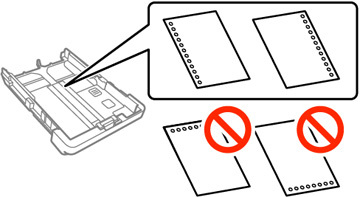 Insert up to 10 envelopes with the printable side facedown and flap edge left, as shown. Note: Load envelopes only in paper cassette 1. Load a sheet of loose-leaf or other paper with holes as shown. Note: Do not select automatic 2-sided printing for this type of paper and do not print over the holes. If prompted by the product's LCD screen, select the size and type of the paper you loaded and select Close. 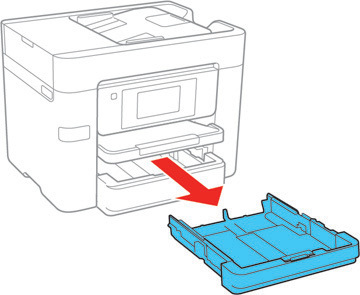 Extend the output tray and open its extension. 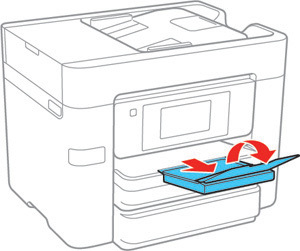 Load paper short edge first and printable side facedown. Make sure the paper is under the tabs on the edge guides and not sticking out from the rear end of the cassette.